Lying in the sand dunes of Baritone Bay are the bodies of a middle-aged couple. Celice and Joseph, in their mid-50s and married for more than 30 years, are returning to the seacoast where they met as students. Instead, they are battered to death by a thief with a chunk of granite. Their corpses lie undiscovered and rotting for a week, prey to sand crabs, flies, and gulls. Yet there remains something touching about the scene, with Joseph's hand curving lightly around his wife's leg, "quietly resting; flesh on flesh; dead, but not departed yet." "Their bodies had expired, but anyone could tell—just look at them—that Joseph and Celice were still devoted. For while his hand was touching her, curved round her shin, the couple seemed to have achieved that peace the world denies, a period of grace, defying even murder. Anyone who found them there, so wickedly disfigured, would nevertheless be bound to see that something of their love had survived the death of cells. The corpses were surrendered to the weather and the earth, but they were still a man and wife, quietly resting; flesh on flesh; dead, but not departed yet." From that moment forward, Being Dead becomes less about murder and more about death. Alternating chapters move back in time from the murder in hourly and two-hourly increments. As the narrative moves backward, we see Celice and Joseph make the small decisions about their day that will lead them inexorably towards their own deaths. In other chapters the narrative moves forward. Celice and Joseph are on vacation and nobody misses them until they do not return. Thus, it is six days before their bodies are found. Crace describes in minute detail their gradual return to the land with the help of crabs, birds, and the numerous insects that attack the body and gently and not so gently prepare it for the dust-to-dust phase of death. 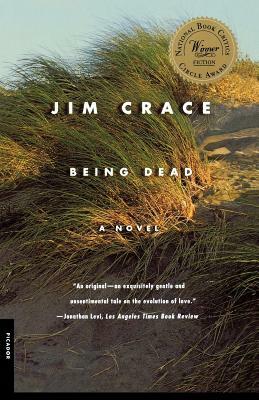 Jim Crace is the author of many novels, including Quarantine, which won the 1997 Whitbread Novel of the Year Award and was shortlisted for the 1997 Booker Prize for Fiction. His novels have been translated into eighteen languages. He lives with his wife and children in Birmingham, England.